Mademoiselle Chou-Fleur: Recipes from our Chef of the Month : Abhijit Saha - Time to get molecular! Recipes from our Chef of the Month : Abhijit Saha - Time to get molecular! I have decided to try and get you guys recipes straight off the country's favourite chefs. I will try and feature one chef per month and share about 3 to 4 of their recipes through that month. I know that is a lot of "try"s but I am rarely in one place for too long to be as consistent as I would like as my regular readers may already know! Cuisine: Mediterranean, Modern European, and for the adventurous - you will be trying your hands on some molecular gastronomy too! He was awarded ‘Best Chef Of India” 2013 at the the ‘Indian Restaurant Congress & Awards’. He is renowned through Bangalore and the country - DNA Newspaper honoured him as one of the ‘50 Most Influential Persons’ in Bangalore. Abhijit Saha is the Founder, Director and Chef of Avant Garde Hospitality Pvt Ltd which owns and operates two critically acclaimed premium restaurants in Bangalore. The first being Caperberry, which has won ‘Best Independent Restaurant in India’ at the Time Out Food Awards, November 2011-12. I would describe it as Modern European but with Spanish and Mediterranean inspirations, along with elements of molecular gastronomy. One of the few and first chefs to be bringing molecular gastronomy to the country. Please refer to my review of Caperberry for more information. Definitely one of the more enjoyable meals I have eaten in the country. Only a true perfectionist could execute food like this. I still crave that potato crusted John Dory w/ Citrus foam! His other popular second outlet Fava, has strong middle-Eastern and Mediterranean influences with a slightly more casual menu. The restaurant has a lounge bar, private dining space and delicatessen. I have never been here so can't add much more. "Chef Saha is one of the youngest to feature in the coveted ‘Hall of Fame’ list of fifty most important people in the Food and Beverage business in India, published by the UpperCrust Magazine in June 2012. He has won the Jury Special Chef of the year Award at the Hotelier India Awards in 2011. In the recent past Chef Saha has been awarded the prestigious Indian Federation of Culinary Association’s ‘Entrepreneur Chef of the Year’ and the South India Culinary Association’s ‘Golden Hat’ for outstanding contribution towards the profession. Rated amongst the top ten chefs in the country by several industry and mainstream publications, he is an expert in Classical and Modern European Cuisine as well as Regional Indian Cuisine. His showcase of Modern Indian Cuisine Menu at Gourmet Abu Dhabi, 2013 received rave reviews from critics and diners alike. A natural orator, Chef Saha is a regular speaker at the The World of Flavour conference in the Culinary Institute of America, IFCA National Culinary Congress and Times of India Literary Festival, amongst a host of other prestigious events. In March 2012 he was invited by TED to be a speaker at Ted X, Coimbatore on the Future of Cooking and Molecular Gastronomy. Abhijit Saha has studied Hotel Management in Pusa, New Delhi and Oenology at the Johnson and Wales University, USA. His keen interest in wines has taken him all over the world, including France, Italy, Spain, California and Australia. He’s the immediate past President of The Bangalore Wine Club, and is a founding member of The Wine Society of India. 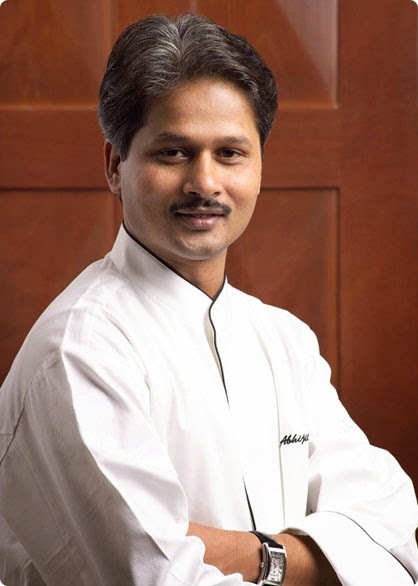 Before choosing to be an entrepreneur, Abhijit Saha worked as Director of Food and Services and Executive Chef with The Park Hotels; as Executive Chef with The Manor, New Delhi and with the Taj Group of Hotels, New Delhi, where he started his career as Kitchen Management trainee in 1990. He is fond of art and design and enjoys F1 racing."